* I accidentally pulled two power wires from the motor when making some re-wiring changes. To save time I’m going to buy another one. 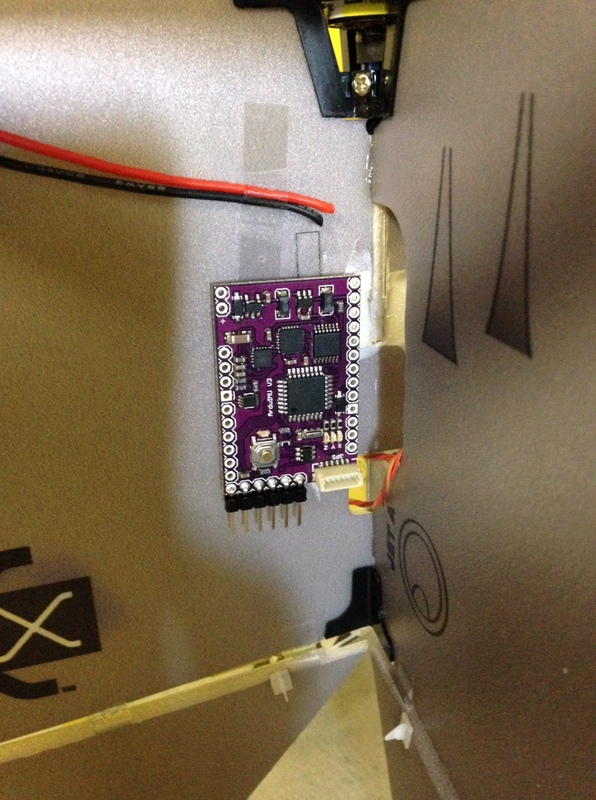 * Now a lot of work with the communication between the ArduIMU and the Pro Mini – the issue is that I can send char data back to the Pro Mini – but the orientation data from the ArduIMU is float. Also when the ArduIMU is set up in as a slave I2C device it seems to zero out the sensors – going to try setting it up as master. * After plenty of trials getting the to Arduinos to talk to each other over i2C I gave up and am going running the whole setup with the ArduIMU. This means I had to solder another pinout on to connect the servo controllers – found the equivalents for the digital ports. MOSI and MISO correspond to D11 and D12. PWM0 and PWM1 are the same as D9 and D10 . Hooked up and working. * Now working on the stabilization code – initial efforts were to hand code the adjustments but I am now using a simple neural net to handle this. Testing the ArduIMU with this approach over the next few days. 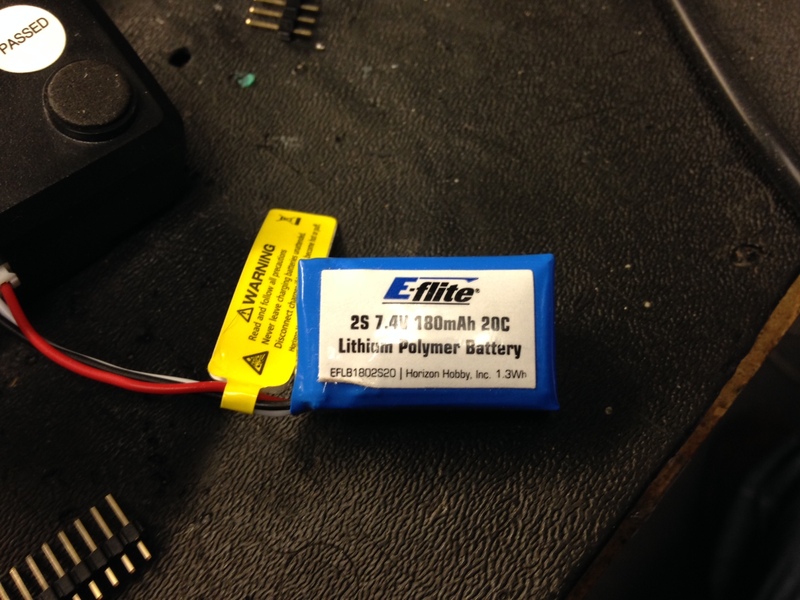 * Next I’m going to hook up the power supply ( a 2S 7.4V 18 mAh 20C Lithium Polymer Battery) to the ESC (Electronic Speed Controller). I’m going to solder 3 breakout pins to the power leads coming from the ESC so that is easier to plug and/or unplug the power supply to the ESC. * Tested the connections I built against the Arduino UNO on the breadboard – it is working – a value of 30 appears to be the low throttle setting – max is 180. * Now need to re-attach the prop and confirm it is turning the right direction before I continue. 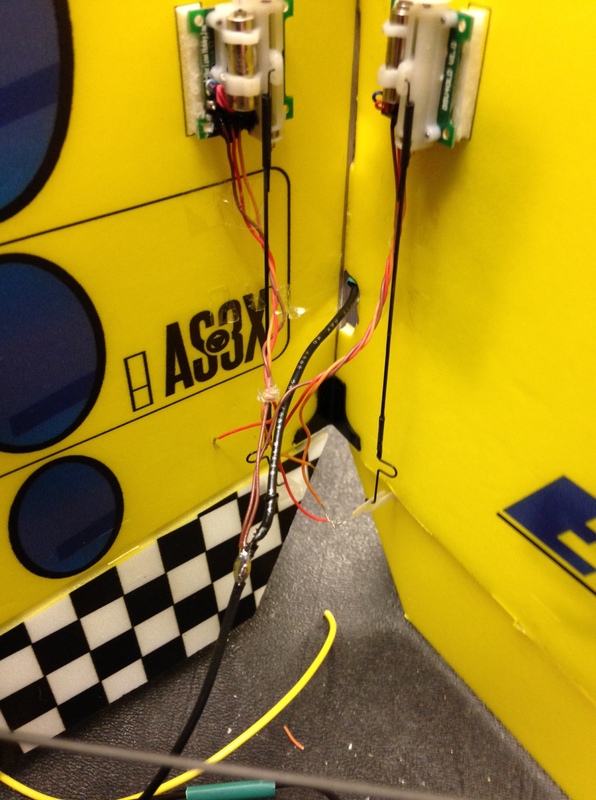 * It is not turning the proper direction – I need to switch 2 wires leading to the ESC – will switch the outside wires. 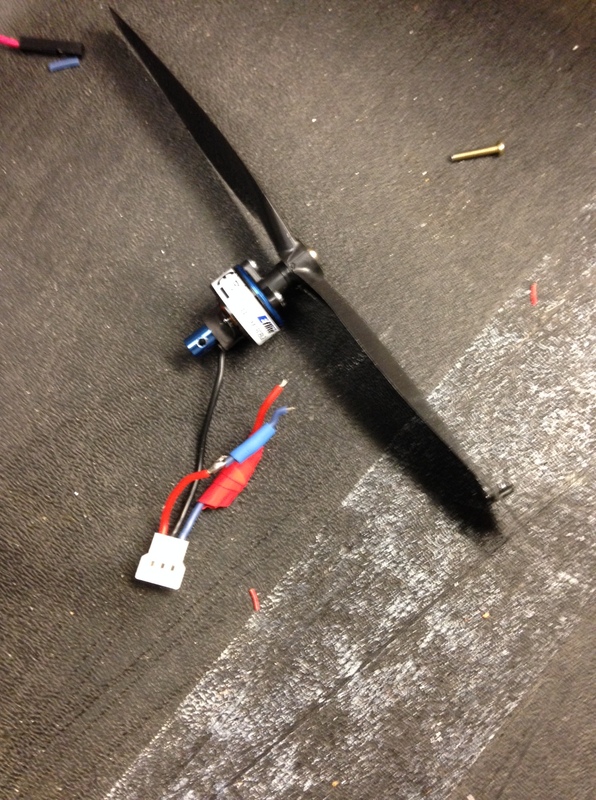 * Got that wired up – tested the prop to full speed and not getting enough thrust to lift the UMX – what the hell? Examined the setup, the code, everything looks okay – looked at the prop – I had screwed it back on upside down after dis-assembly. So for the record the motor and prop combination doesn’t work well if the prop is bolted on upside down – fixed now and working – UMX lifts off at throttle setting of 130 (scale from 30 to 180 full throttle). * Now wiring all 4 servos into one power and ground cord – lots of fiddling and detail work to get all the wires where I need them to be. Still working on this, taken several hours to get the servos connected properly – huge pain. I was trying to do this individually but instead did the power and ground cords in series, they are all plugged into a single wire for power and a single for ground – this is working. * Each servo needs a separate signal wire – so I soldered the 4 individual leads and am now testing each one to confirm they work. Dorsal – works, Starboard – working, Port – works, and Ventral – working. 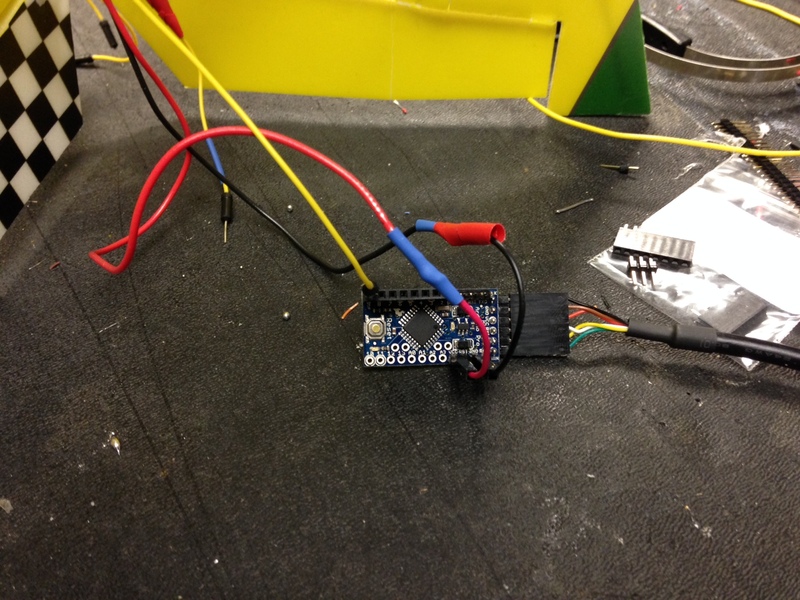 * Now I’m going to test if the servos can run from the arduino’s power board, and not a separate power source. 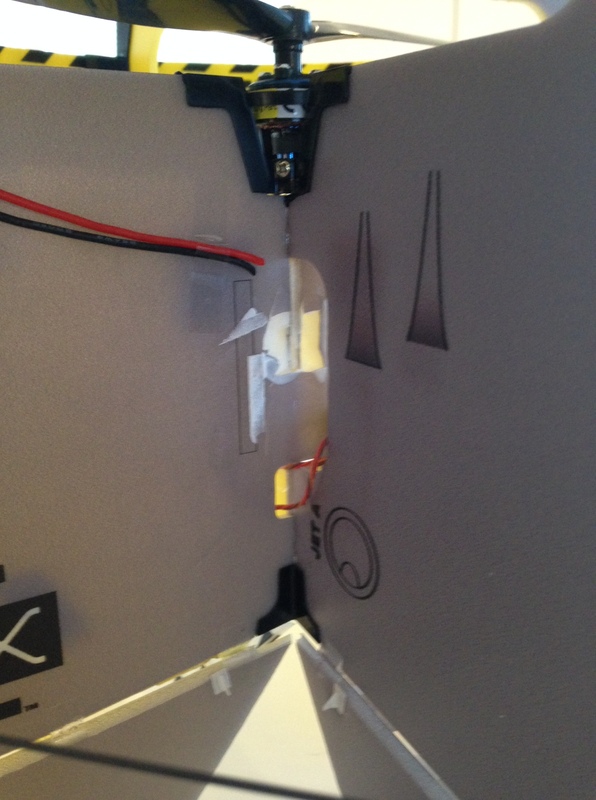 In the flying version the lithium battery will send power to the ESC, the ESC sends power to the flight motor and the arduino board. 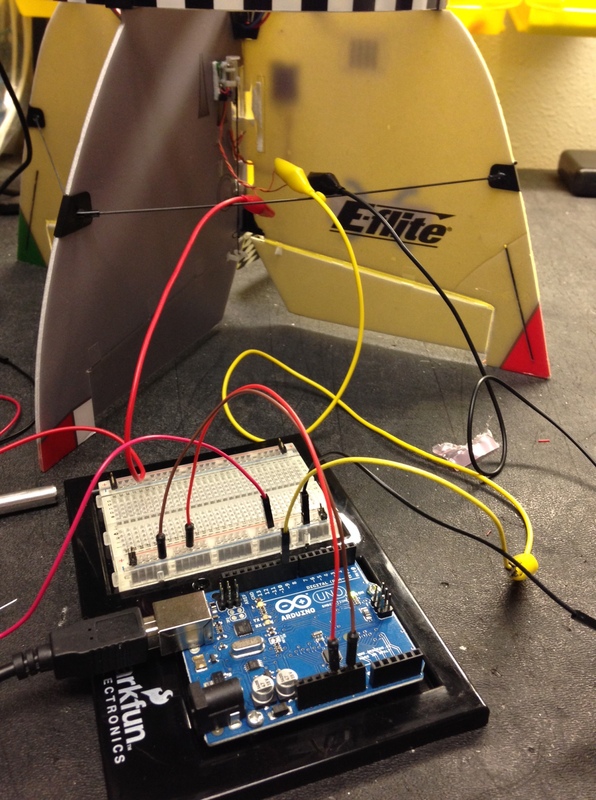 If I can power the servos from the Arduino it will simplify the setup. * This is working – now need to begin connections to the actual Arduino Pro Mini I’m going to use for flight tests. * Soldered pin outs for the servo connections, plus for the power supply and ground for the servos. 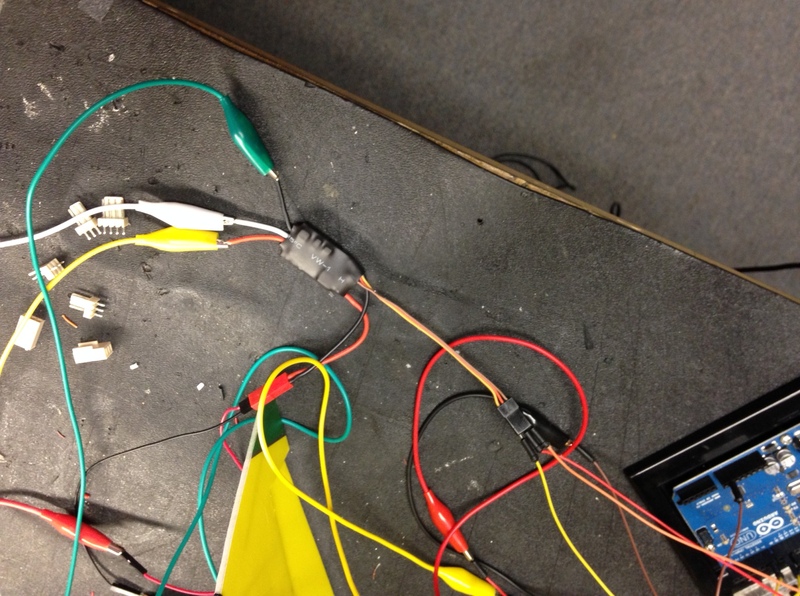 * Connect servos control and power/ground leads to Arduino Pro Mini and test … working. * Now confirm Arduino Pro Mini can control the main motor as it is currently connected – done. 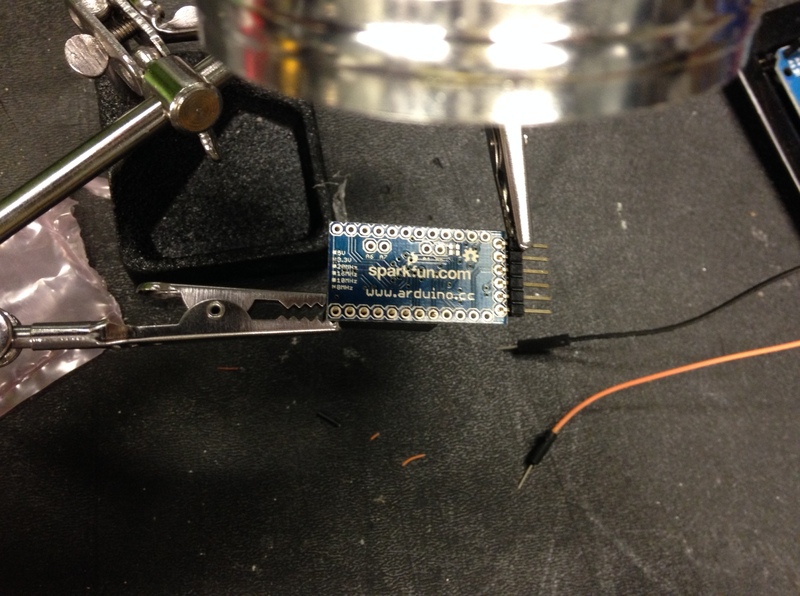 * Now the tough part – the existing code I have outputs roll,pitch,yaw data from the ArduIMU over the serial port. I can’t receive this data over serial with my main Pro Mini board and have my Mac USB connected at the same time – which will make it very, very hard to debug. To get around this I’m going to use IC2 to send data from the ArduIMU to the Pro Mini. 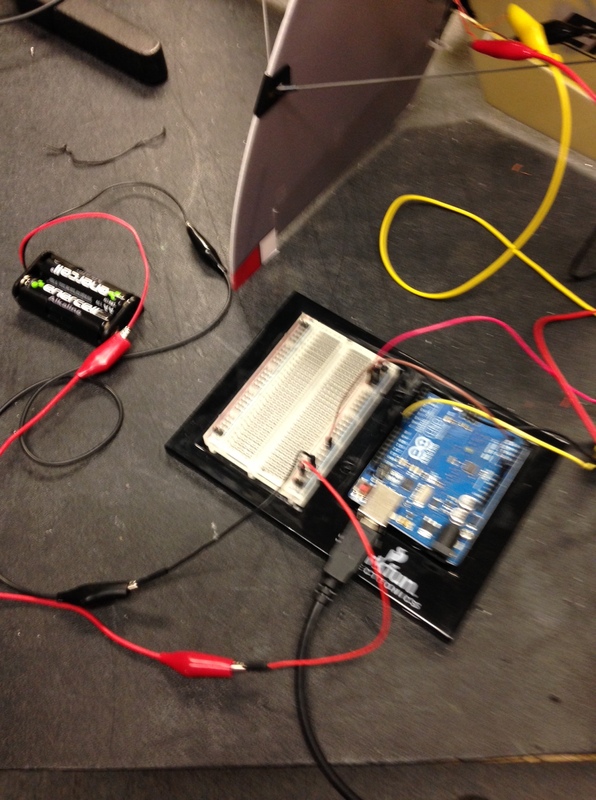 This is working – I can send data from one Arduino to another without using the serial port. 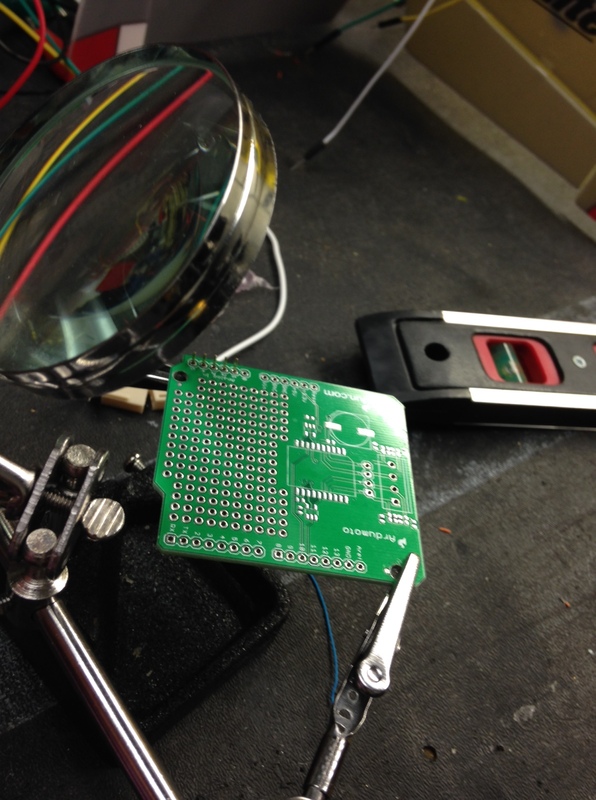 * Now modify the AruIMU code to send the roll, pitch, and yaw data via IC2 – this is working. This is continued from Hacking the UMX part 1. * Need to wire the rest of the servos to the controlling Arduino – this is more power than the Arduino can supply directly so I’m going to have to wire a separate power source. I’m using the tutorial at RCArduino as my starting point. Will use 2 Double A batteries for now. 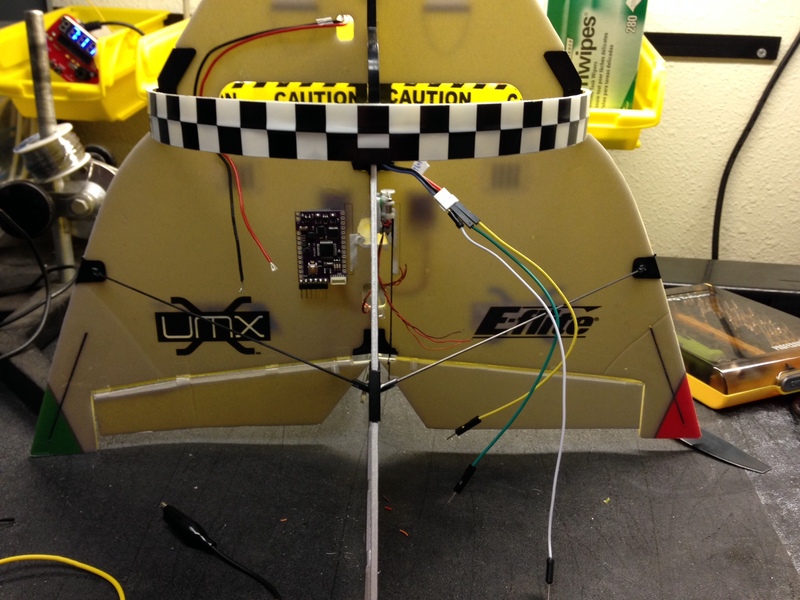 * Now have 2 servos under control – dorsal and ventral – naming conditions for servos are (assuming black cockpit image on UMX is top and craft is in level flight – all directions in reference from cockpit image) – dorsal (top), ventral (bottom), port (left), and starboard(right). * To control a brushless motor from the Arduino requires an ESC (Electronic Speed Controller) – I’m using EFLA7200 BL Controller 8A from E-flite. The manual is here. to control the main motor. It worked fine and I can now control the speed of the motor. * I have the components and initial code working on the breadboard and the Arduino Uno. Now I need to move all the parts to the next stage so that the UMX can fly. This will require soldering and the Arduino Pro Mini instead of the Uno. * To get the UMX flight ready I remove all of my jury rigged experiments and breadboarding. 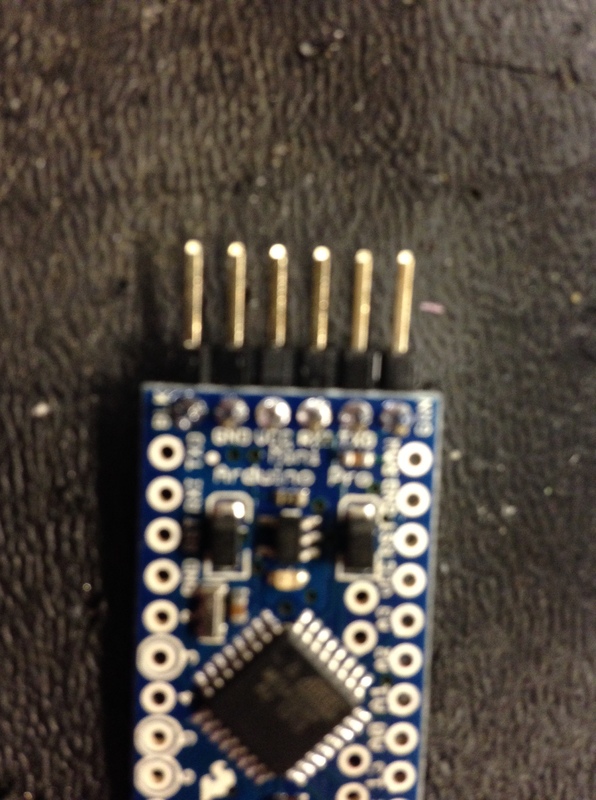 * The Arduino Pro Mini has no built in connectors so everything will have to be soldered. I have never soldered in my life so I practiced on some spare boards and pins (SparkFun seems to have a lot of these – I used their tutorial as well). 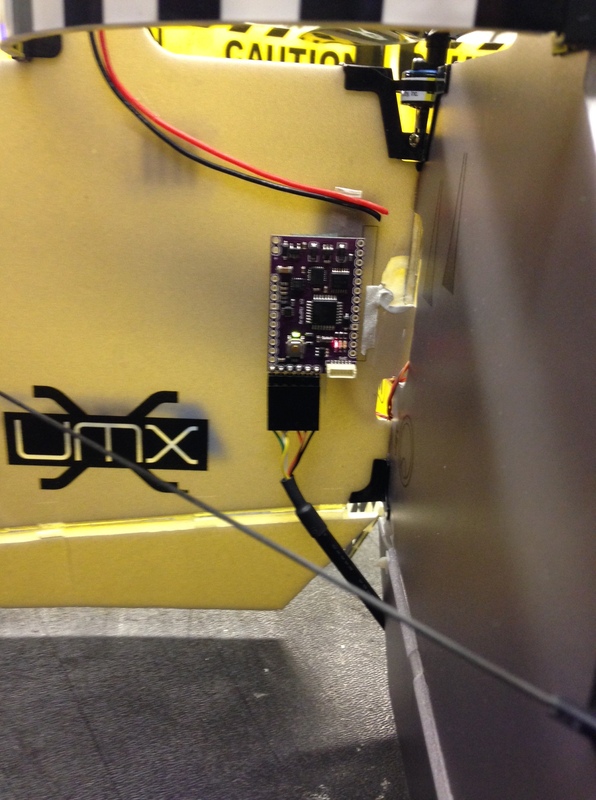 * Next steps are wiring up the UMX power supply. Steps to get the UMX ready to work with the two new Arduino controllers. * Cut the wires between the battery pack and the DSM 6ch UM AS3X RX BL-ESC; HT. 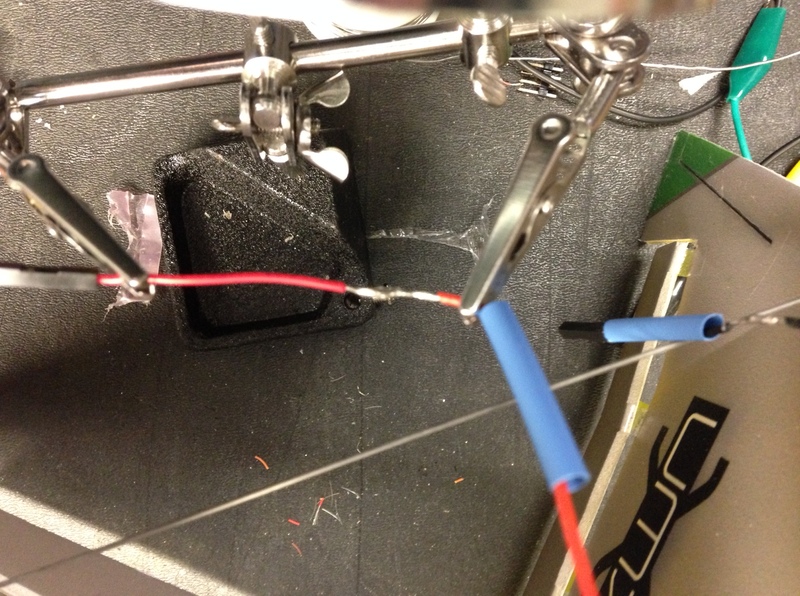 * Snip the connecting wire between main electric motor and the DSM 6ch UM AS3X RX BL-ESC; HT. * Cut the wires between the DSM 6ch UM AS3X RX BL-ESC; HT. and the four 2.3-Gram Performance Linear Long Throw Servos. Leave the servos in place, they’ll be used later. 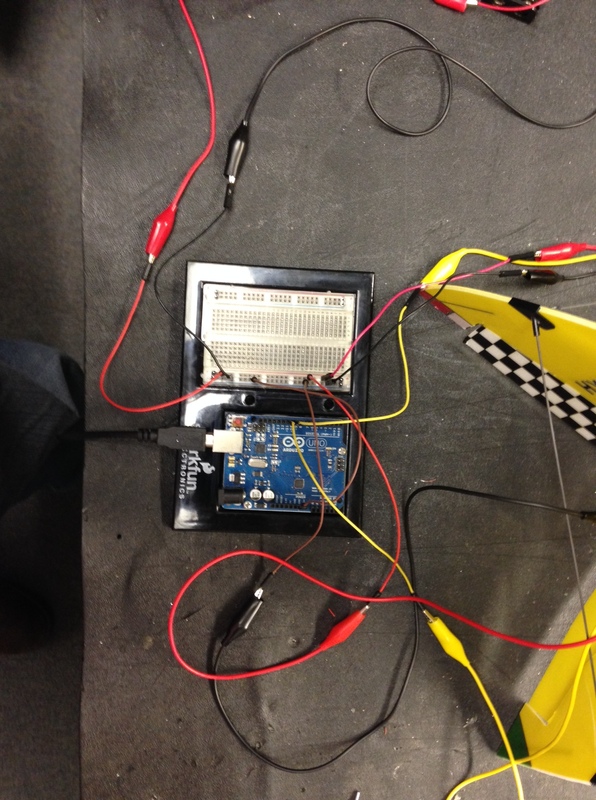 * Now the ArduinoIMU needs to be calibrated and we’ll see if we’re getting realistic values for roll, pitch, and yaw. For now the IMU will be connected directly to my Mac so I can see the values directly in the serial monitor. * I’m using as a base for my code the excellent work by Al Toma – his code is at – ARduImuV3 code. * Connect my mac to the ArduinoIMU via a FTD cable. * Run the calibration routine, store calibration values to eprom. * Now run sketch that reports orientation values to the serial port – monitor and confirm they’re working. * This is working – I can read orientation values from the IMU and fire the one servo to adjust the control surface up, down, or neutral. * code/hardware so that the drone will follow the user within a certain distance, probably using iOS beacon tech (Bluetooth LE) – no obstacle avoidance, just follow. To simplify the issues – I’m going to start by hacking an existing RC controlled tailsitter – it is a UMX Hyper Taxi with a DSM 6ch UM AS3X RX BL-ESC microcontroller and receiver, one BL180 Brushless Outrunner Motor, 2500Kv, 5.5 x 2.0 Electric Propeller, four 2.3-Gram Performance Linear Long Throw Servos, and a 180mAh 2S 7.4V 20C LiPo battery. Once the stabilization code is working on the Hyper Taxi and if time permits I’ll create a new UAV from scratch with a sphere form factor – initially basketball sized, then going to smaller models as the design progresses – see Spherical Flight Vehicle, Kyosho Space Ball, Puzzlebox Orbit, or GimBall for examples. Besides the Hyper Taxi I will need one ArduIMU+ V3 – this microcontroller will supply the orientation and acceleration data that my program will need to figure what control inputs are needed to stabilize in hover. A second Arduino Pro Mini 328 will run the main program plus control the 4 servos connected to the control surfaces and the main lift motor. These two Arduinos will replace the existing HyperTaxi microcontroller and will send the necessary commands to the craft instead of RC commands from a human pilot. A big challenge is that I’m attempting to do this without GPS – there may be orientation and drift issues that I won’t be able to compensate for – we’ll just have to see…. 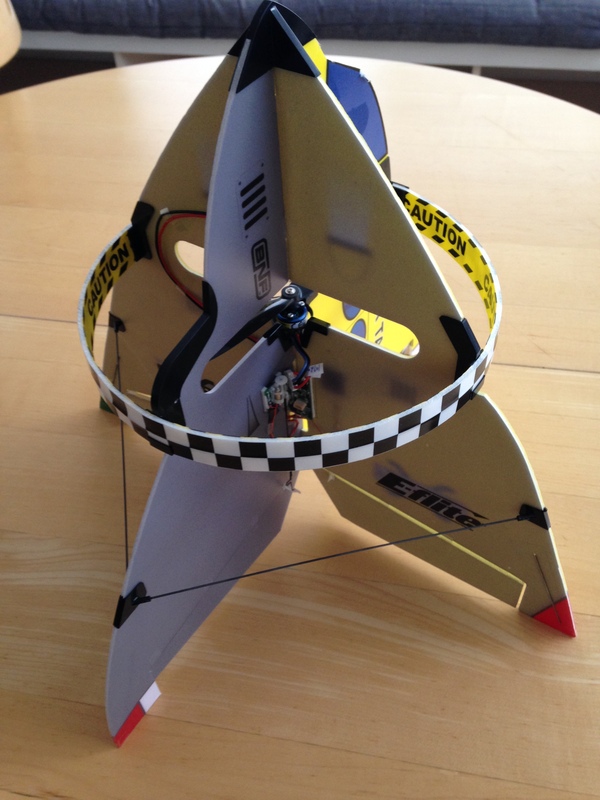 This is a blog about creating a single propeller flying UAV that is as maneuverable and stable as a quadcopter. The single larger rotor is more efficient, quieter, and should be cheaper to build as well. I’ll use software and aerodynamic forces (ailerons & rudders) to keep the single prop design stable in hover. I chose this project because I am very interested in solving real world problems with ‘swarms’ of simple flying robots. Before doing that I need to as a first step to design extremely low cost basic flying robots that eventually will work together to perform tasks in the real world. I’d like to see the world of robotics focus on generic, modular, and cheap hardware that can be re-configured by software on the fly to handle different conditions and/or tasks – instead of expensive hardware customized for every task. 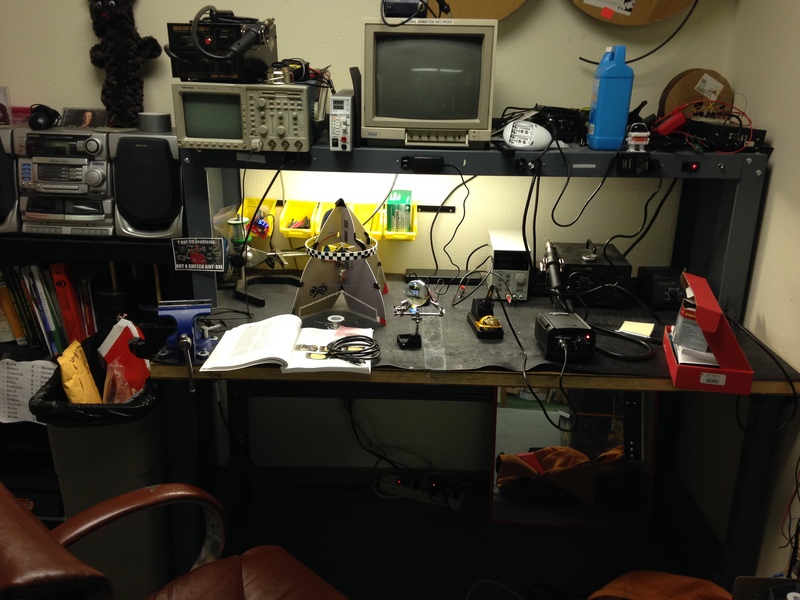 This project was kicked off as part of SparkFun’s ‘Hacker-In-Residence’ program. I can’t thank them enough for the help and support.